The definite article in the title is significant: this concerto, for piano and small orchestra, is based entirely on material selected from my soundtrack for Jane Campion's film THE PIANO. 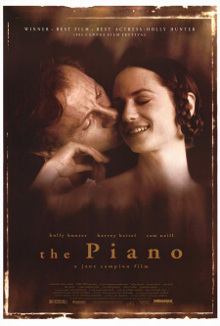 That score was written in two phases: the solo piano music was composed for Holly Hunter (who played Ada, a pianist, in the film) in the autumn of 1991; the orchestral score, partly derived from the piano music, after the film was completed in the summer of 1992. THE PIANO CONCERTO, commissioned by the Festival de Lille, was composed in spring 1993 and first performed by Kathryn Stott with the Orchestre National de Lille under Jean-Claude Casadesus on 26th September 1993, along with the premiere of MGV. This 'reconsideration' of the film soundtrack enabled me to achieve (at least) three goals: to create a more coherent structure out of often short self-contained film cues; to build more elaborate, dynamic textures than were called for in the film (with its more limited palette of string orchestra and saxophones) and to write a more taxing piano part than was suitable for THE PIANO. THE PIANO CONCERTO is a single movement work in four distinct phases, three of them featuring 18th and 19th century popular Scottish song tunes which formed the basis of Ada's music in the film. The first phase in A minor is derived largely from 'Bonny winter's noo awa'; the second, harmonically more chromatic, has no Scottish based material; the third (in G/D major) features two Scottish tunes - 'Flowers of the Forest' (cut up and speeded up) and 'Bonnie Jean' massively slowed down, the tune, on cellos and trumpet, and the bass to divisi violins), and a non-Scottish melodic sequence, based on harmonies heard in the opening section, acts as a transition to the final section which reprises 'Flowers of the Forest' and 'Bonny winter's noo awa'.